Water-colour painting of the village of Namik (Almora District, Uttar Pradesh) by James Manson (1791-1862), c.1826. 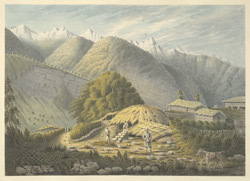 This image is from an album of 12 drawings of landscapes in Almora and accompanies a 'Report of the Mineral Survey of the Himalaya Mountains lying between the Rivers Sutlej and Kalee' by Captain J.D. Herbert, dated 1826 (Mss Eur E96, Kaye no.377). Manson was assistant to the Superintendent of the Geological Survey of the Himalayas from 1823 to 1828.